Our thanks to landscape designer Aaron Odland for this creative consideration of the habitat potential of urban cemeteries. Images courtesy of Aaron Odland. When we think about the urban forest, its street trees and parks that often first pop into mind as prime constituents. But there are other institutional land uses that contribute a great deal of square footage to the urban tree canopy. According to the 1994 study "Chicago's Urban Forest Ecosystem: Results of the Chicago Urban Forest Climate Project", 49% of Chicago's 4.1 million trees at the time were on institutional land dominated by vegetation. This category includes parks, forest preserves, golf courses, and cemeteries. This study also found that the tree composition throughout Chicago was dominated by the pioneer species green ash (12.9%) and cottonwood (15.8%). While any type of tree canopy might contribute to the infrastructure tree benefits of stormwater retention, air pollution removal, energy reduction, etc. it's habitat value that really suffers from a as a lack of diversity of tree types and sizes. So, if one is going to improve urban forest structural composition, what better place to start than these institutional lands dominated by vegetation? And cemeteries, I think, are one of the most overlooked sources of potential urban habitat. Chicago is home to numerous historic cemeteries, such as Graceland Cemetery (burial place for Daniel H. Burnham, Louis Sullivan, George Pullman, etc.) and Rosehill Cemetery (final resting place for Charles M. Schwab, Richard Warren Sears, Oscar Mayer, etc.). 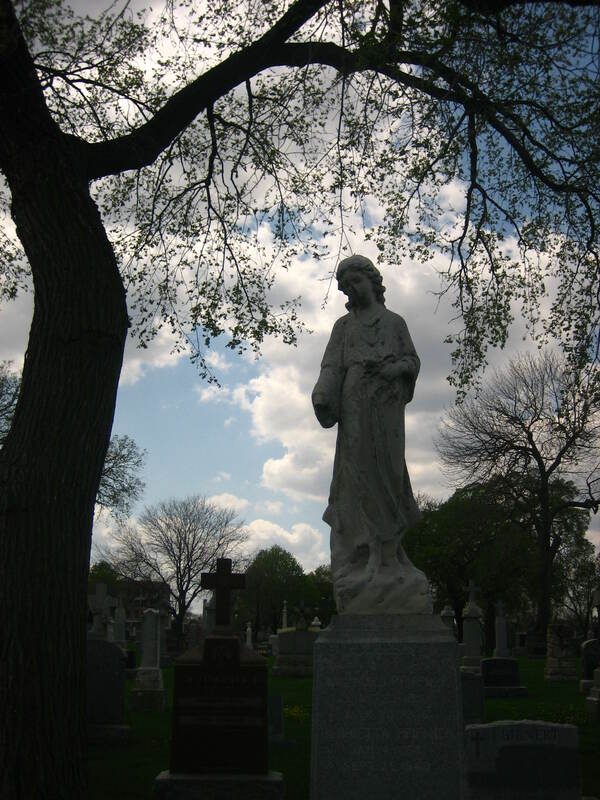 Rosehill is the largest cemetery in Chicago, covering 350 acres, but there are some more modest burial grounds in the city, such as St. Boniface in the Uptown neighborhood, which is about 34 acres. 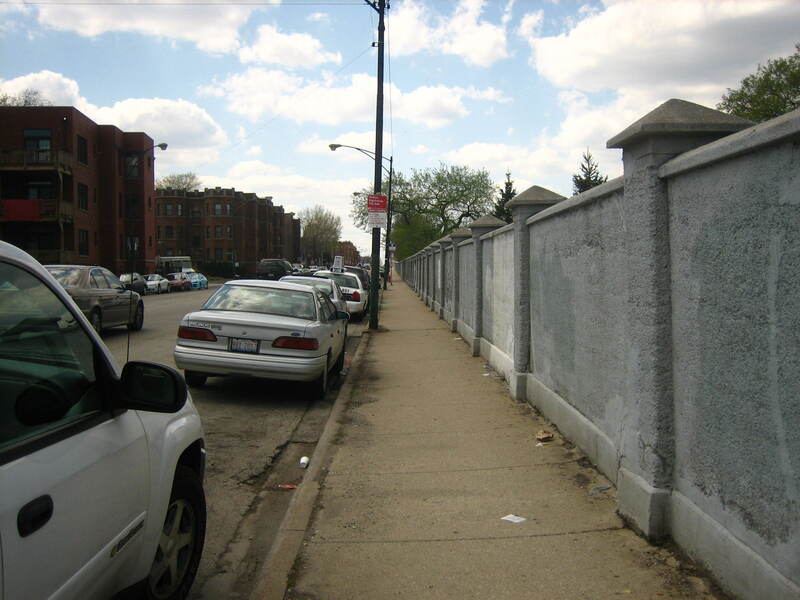 Considering that the average residential block size in Chicago is about 5 acres, this smaller cemetery is still an impressively large piece of real estate in a dense urban area. To cobble together such a contiguous piece of land today in any major city would be virtually impossible. Such parcels exist only because of their historic use. Using the "L" train line as and its stops as a reference point, if you look out 1/4 mile radius from the train stations in the Uptown neighborhood, there is not a great deal of park land evident. And that which does exist cannot compare in size to St. Boniface Cemetery. The surrounding buildings tend to be multi-story residential or mixed use, and the surrounding streets don't all have street trees or much vegetation at all. So the green space provided by the cemetery is important to the neighborhood and its habitat potential. There are quite a few mature trees in St. Boniface Cemetery, and in the midst of it you can feel quite separated from the hustle and bustle of the city. 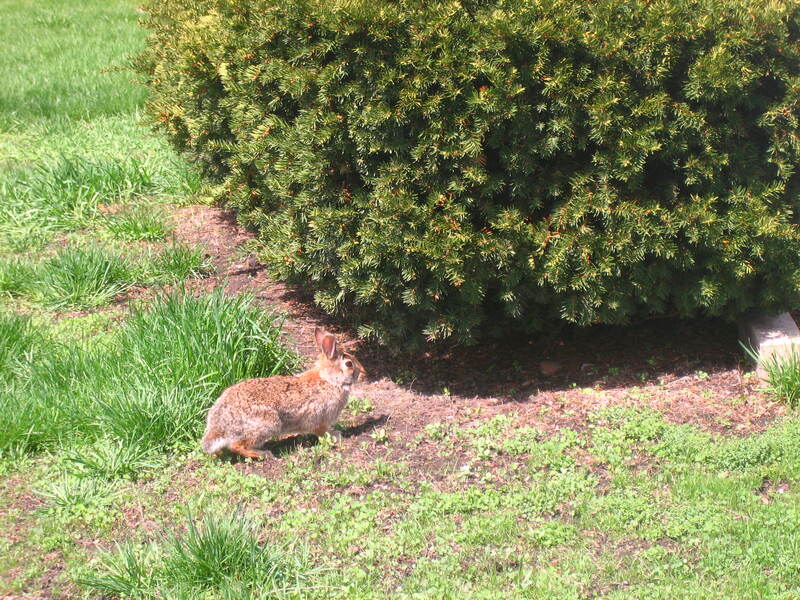 I saw a rabbit peeking out of a shrub during my visit there, and friends who live nearby have told me of seeing foxes. There also are peregrine falcons nesting on the adjacent Uptown Theater for the last ten years, which I would think must have some relation to the proximity of this large green space. Cemeteries are, or course, primarily a place for burial and remembrance of the dead. So, habitat for flora and fauna must be a secondary concern. In an ideal situation, once could guide the cemetery's vegetation to represent a mix of grassland, shrubs, understory trees and larger shade trees that would provide a diverse range of habitat for wildlife. But, the current aesthetic of American burial spaces is deeply rooted in the English pastoral landscape tradition with large swathes of green lawn with patches of trees. Perhaps it is that trees in manicured, mowed turf provide an orderly landscape that suggests man in control of nature. Regardless, the question becomes how to respect this aesthetic that people expect for burial of their loved ones while still improving the habitat value of the cemeteries. If we remove the horizontal plane from design consideration and assume it to be turf grass, this still leaves the vertical plane to manipulate. This vertical realm is perhaps best suited for improving bird habitat. A mix of tree levels is very advantageous to a broad range of species as not all birds like the same food, nesting conditions, etc. According to an Ohio Department of Natural Resources article Song Birds in the Urban Forest? Trees Make It Possible, "the top tier of tall-growing hardwood species like maple, hickory, oak and elm is the nesting ground to Baltimore Orioles, Red-Eyed Vireos, and Scarlet Tanagers. The acorns and nuts from these trees also provide food for various species. Nuthatches prefer tall evergreens for nesting, and many birds may eat the sap, seeds and needles of these trees that also provide shelter from weather and predators. Mid-tier trees such as mulberry, redbud, plum, etc. 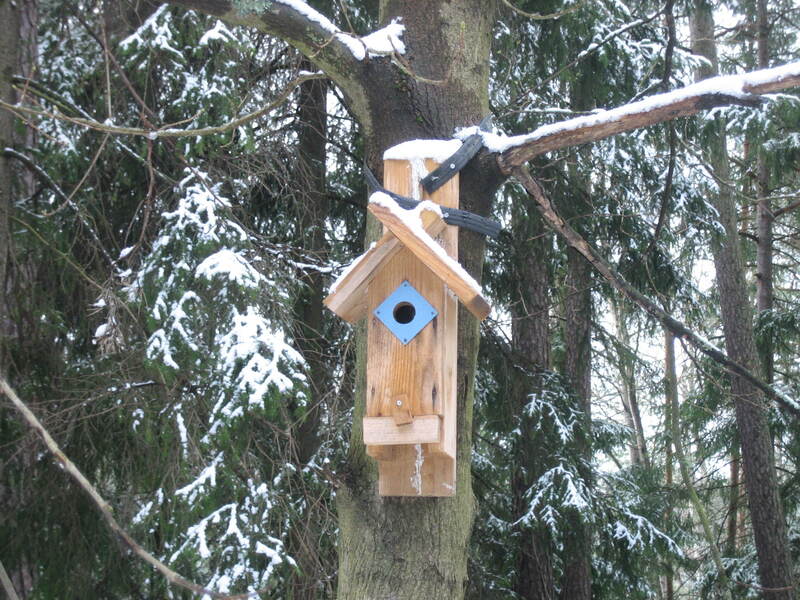 provide a variety of food and also nesting places for species such as Wood Thrushes. Moving down, lower tier hollies and shrubby dogwoods attract many birds, such as Cardinals and Gray Catbirds. Finally at the ground level, having open habitat encourages specific species like the American Robin and Bluebird." Cemeteries already have that final condition available, which is a good start. So what is the incentive for cemeteries to increase their tree diversity to improve wildlife habitat? Perhaps city programs targeting sustainability could be funding sources, but I think there might also be private revenue streams to tap into, especially in the case of habitat improvements that will attract more birds. According to a 2006 US Fish and Wildlife Service report, there were 48 million birders in the US, which was 21% of the US population at the time of the survey. They define "birder" as someone who makes a trip 1+ mile from their home to look at birds (excluding zoo visits) and/or tries specifically to identify birds around their home. The trip-related and equipment-related expenditures associated with birding in 2006 generated over $82 billion in total industry output. So, it's big recreational business, and at a time when cemeteries are struggling to find new revenue sources for their upkeep and maintenance, a bit of this money could be a boon. How could cemeteries attract birders? 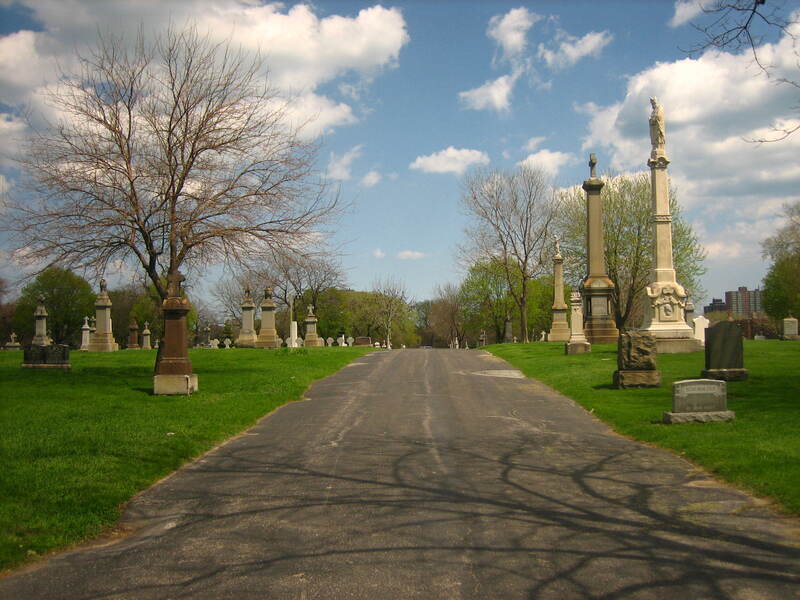 Many historic cemeteries, such as Chicago's Graceland Cemetery, offer tours. For example, The Chicago Architectural Foundation has $15 tours on Sundays from August through October. Why not have a bird watching tour sponsored by a group that shares some of the income with the facility? The tour could even highlight the habitat work through the tree plantings and solicit donations for continued improvements. 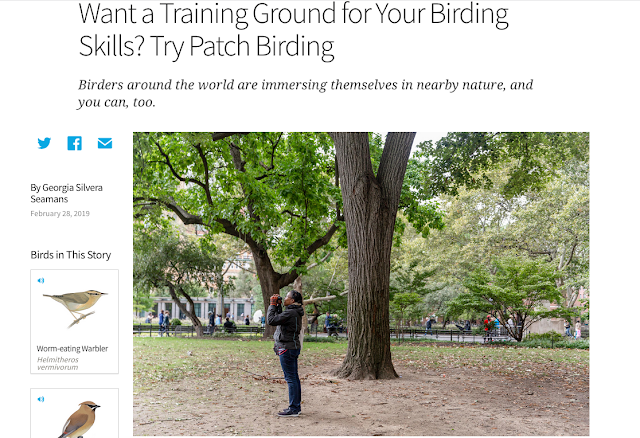 This is just one idea, but I'm certain that in some capacity, if you build the bird habitat, the birders will find it, as they do carry binoculars. Aaron Odland is a landscape designer for Ten Eyck Landscape Architects in Austin, TX. Odland received his Master of Landscape Architecture from UC Berkeley. His appreciation for quiet spaces and Chas Addams comics has fostered his interest in cemeteries. Excellent!! This is a subject that I've been slowly pulling information together and I find it really interesting. I agree, cemeteries are an overlooked area for urban habitat, with much potential too. On the University of Oregon campus there is a cemetery that we actually walked through as part of our landscape ecology class. It's full of wildlife, really wonderful. Awhile back I gave a talk about my comprehensive project at a cemetery association's conference where the theme was 'green'. There was a lot of interest in making cemeteries more ecologically friendly. Many people are looking to be buried in cemeteries that are 'green' and it's becoming a new industry. So in active or newer cemeteries there is an incentive. Thanks for the feedback, Kelly. It's good to hear that cemetery associations are taking an active interest in sustainability. I hope your comprehensive project is going well! Kelly: Thank you for your comment -- I am glad that Aaron was able to contribute this essay. If you wrote about your walk through the U of O cemetery, I'd love to post it on local ecologist. In the heart of Brooklyn, N.Y., Green-Wood Cemetery provides a plethora of habitat for plants and animals.